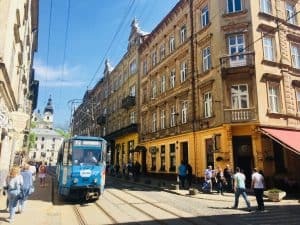 I discovered when I booked my trip to the Ukraine’s seventh largest city, Lviv, that it’s really not well known at all. 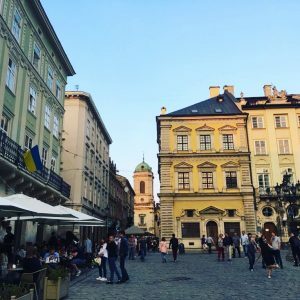 No-one that I mentioned it to had visited and Ukraine itself didn’t seem to be on many people’s wish list; in contrast to the almost 10 million visitors annually to Warsaw, just a short flight away, Lviv attracts only around 2.5 million visitors a year. Maybe this is because it takes a little more time to get to, (at least from London), or maybe it’s because there are so many other places to visit on a short weekend away that it’s overlooked. But if that’s the case, we’re all making a huge mistake. 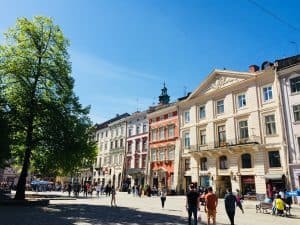 It’s a charming city, perfect for a weekend break, and definitely worth the small effort to get there. It really is. 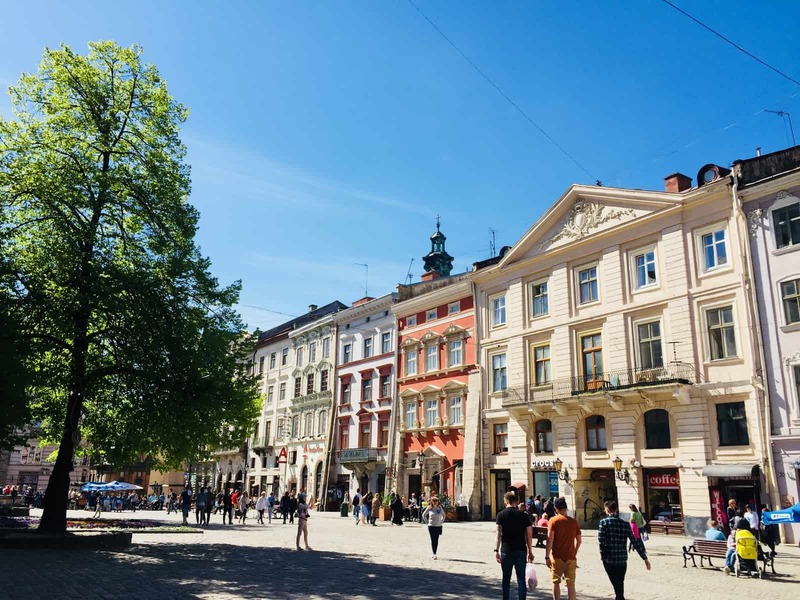 Designated a UNESCO World Heritage site, and having largely escaped the Second World War unscathed, the city centre revolves around Rynok Square, a delightful cobbled square that surrounds the City Hall. This is framed by over 40 period buildings some of which are now museums, or cafes and bars with outside seating where you can watch the world go by. The City Hall has a tower which you can climb offering excellent 360 degree views across the entire city. 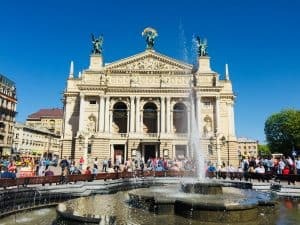 There is also Lviv’s stunning Opera House, a gorgeous Viennese building, built in 1901, and next to a large flowing fountain; approach from the square with the Shevchenko Monument and you’ll get to wander through a lovely small pathway that is a market with traditional wooden huts that sell local delicacies and trinkets and with pretty flower garlands hanging overhead. Part of the city’s charm is wandering through its streets, past imposing and impressive churches that reflect the Lviv’s rich and diverse cultural history. 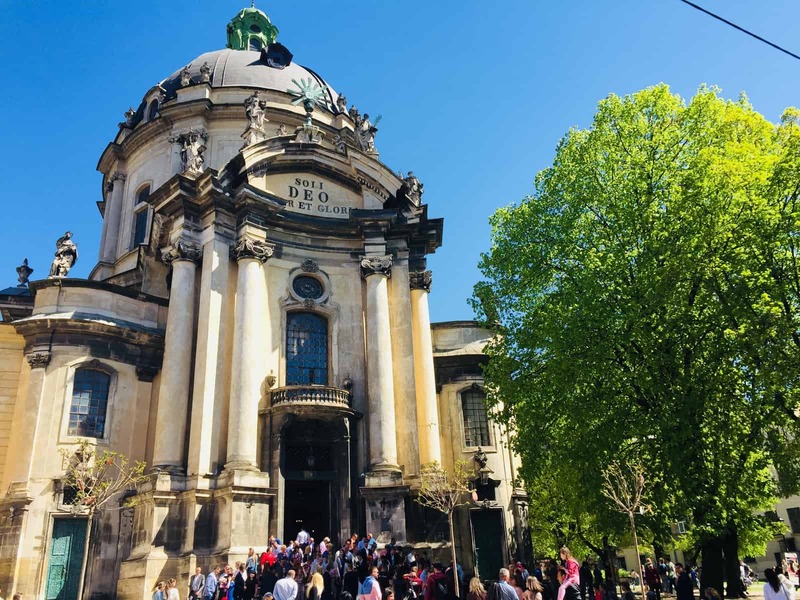 Just one street away from Rynok Square is the magnificent Dominican Catholic Cathedral, which itself is a short stroll away from the Armenian Cathedral, Latin Cathedral and Jesuit church. There are also plenty of green spaces in the city to bask in the sun or take a wintry walk – these include several parks, not to mention the High Castle Hill which is sat in just under 90 acres of parkland. 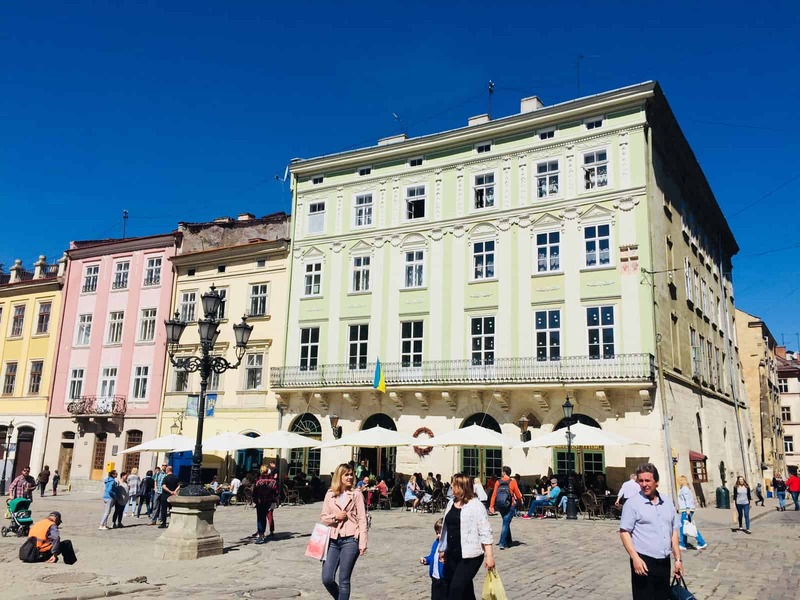 The climb to the top of the castle (now a ruin and where a large Ukrainian flag flutters majestically) is worth the effort – you’ll be at a height of over 1300 feet and gazing out over the city’s roofs. 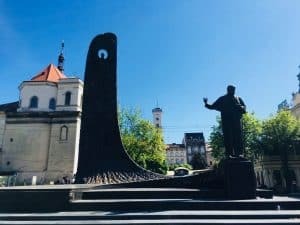 You can also see further afield to the city’s industrial, Soviet past with rows of tenement blocks as well as small villages and local churches, often with glistening golden domes. 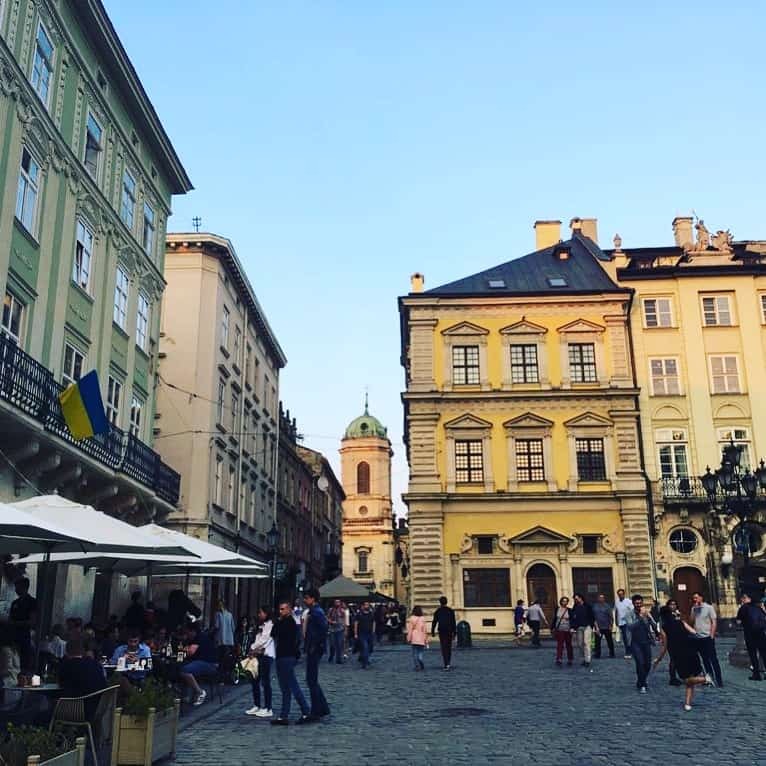 Lviv is big enough for there to be enough to do, but small enough to feel you’ve made the most of your time. We stayed right in the city centre (it’s so cheap here that it’s possible to stay right in the centre) and we didn’t need to take public transport once. Even a trip to the High Castle Hill towards the edge of the city can be done on foot (although a few steep climbs are involved). However, if you fancy it, there are plenty of trams and buses regularly running throughout the centre that you can hop onto. We only made it to one museum – the Department of Liberation Struggle – which can be found on the way back from the High Castle Hill. If you like your history, it’s definitely worth a stop here to wander around its small number of rooms, each displaying a wealth of impressive archive material documenting the country’s struggle for independence between the two World Wars. You’ll notice that none of the displays have an English translation, but don’t worry, each room has a large English synopsis (located as you enter the room) which provides a fascinating read about Ukraine’s turbulent history. Entry is less than £1. Other museums in the city include the Museum of Folk Architecture and Rural Life, an Armoury Museum, a Pharmacy Museum, art museums (for example the Andrey Sheptysky Museum), a glass museum, the Museum of Ancient Books, the Museum of Ideas and various history museums. There’s also a chocolate museum and a beer museum. 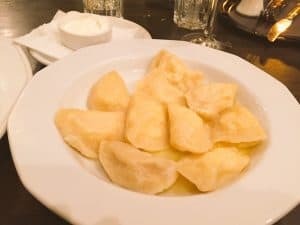 We didn’t have a single bad meal and even on a short break managed to try out a few different things: pork, chicken, vereniki (dumplings with a variety of fillings, including some that are vegetarian), deruny (potato pancakes served with sour cream), and roasted vegetables. There are also various soups on the menus, including mushroom yushka and borsch. Everything we tasted was utterly delicious and really fresh. Even if you don’t eat meat, there are plenty of alternatives for vegetarians (although it helps if you like potato!). There’s also some decent local wines and beer to savour. 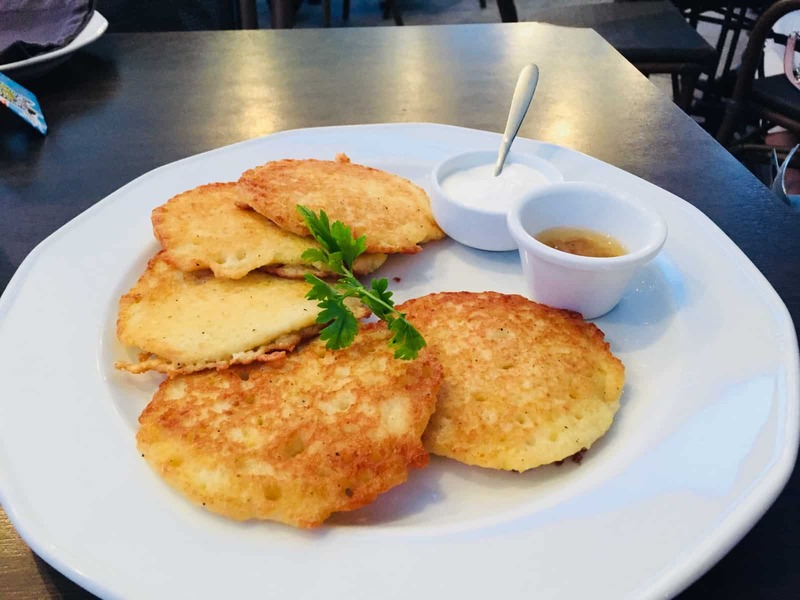 If you don’t want to stick to the local cuisine all the time, there are plenty of other options on the menu – restaurants are plentiful and cater to anything from Austrian to Italian, and even Mexican. You should also consider the many small cafes and bakeries to stop off at for a quick snack. 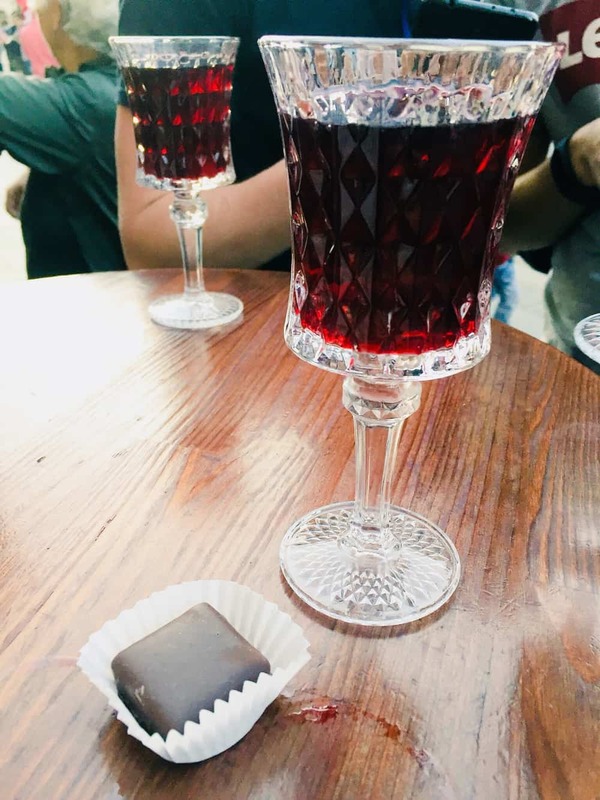 If you like your drink, you must try the local cherry liquor; you’ll find one of the unique liquor stores selling this in Rynok Square, as well as on adjoining streets, and on sunny evenings, these have a great vibe – buy your liquor inside the shop and then join others outside on the street to drink it. We did this on a sunny Saturday evening which was a great way to soak in the evening atmosphere in the city centre and get chatting to a few of the locals who were also drinking there. If you don’t drink alcohol, or are a fan of coffee shops, there are plenty of these to be found in the city – some are chain branches, but there are other more traditional ones (almost akin to traditional Viennese coffee shops); many seem to stay open until at least mid-evening. You’ll be amazed at just how affordable a city break is here. We stayed just a 10-minute walk from Rynok square and paid less than £45 a night for two people, with breakfast thrown in (which had a fabulous choice of dishes). Vegetarian main dishes tend to be around £2-£3 each with meat dishes a little more expensive. 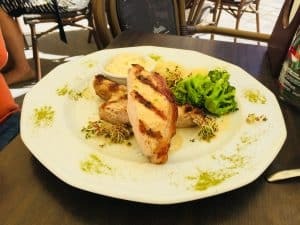 We found it perfectly possible to eat out in the main square, including a couple glasses of wine and water and a generous tip, for around £15 for two people. Entry to museums and fares on public transport are less than £1 per person and a taxi from the airport is around £5. 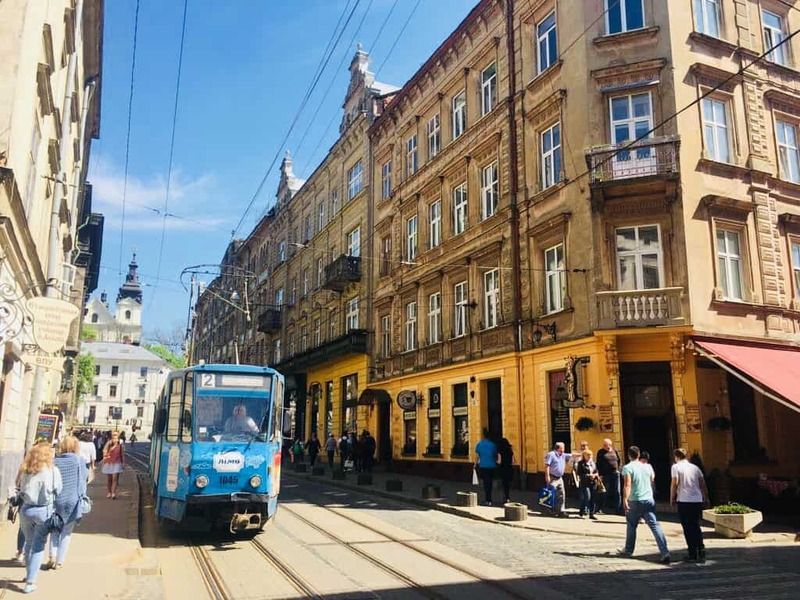 Although Lviv might not be that well known – as least not in Western Europe – when you do an internet search, you can find a number of articles on visiting the city, all of which encourage people to go now. 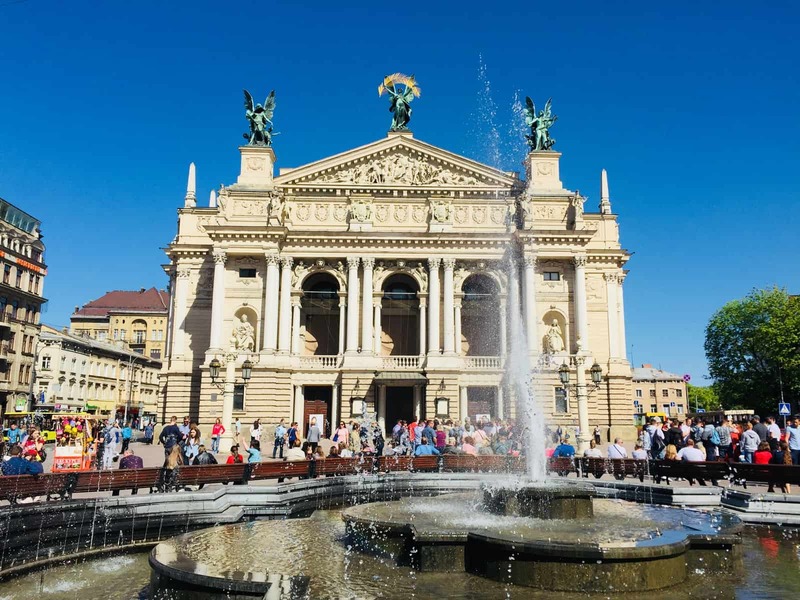 And although overall visitor numbers have dropped in Ukraine over the last few years, it is likely that, as with many cities in Eastern Europe, over time more and more people will visit. This may change the city’s laidback vibe, driving up prices as crowds descend on the city. 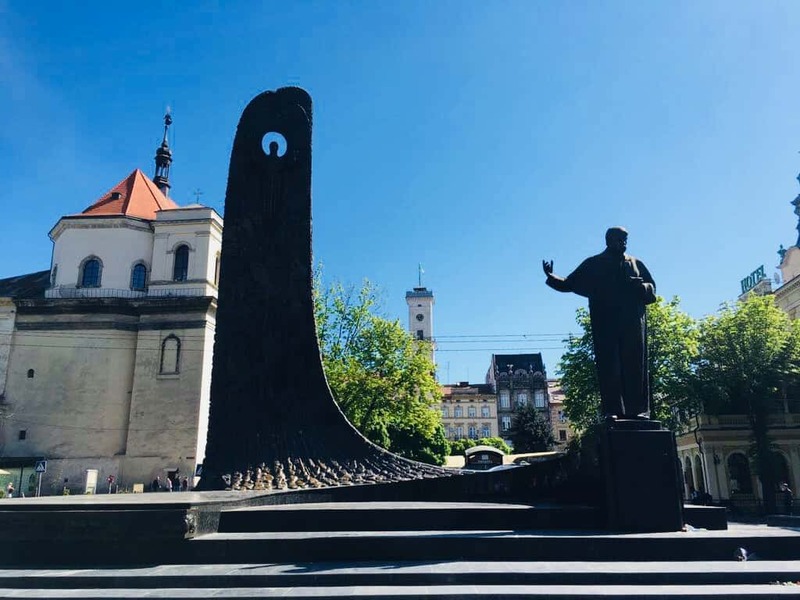 I’d therefore recommend putting Lviv on your list of weekend breaks – go now before it changes.